The Moon is Earth’s closest satellite in our solar system, but in many ways, we hardly know our neighbor. 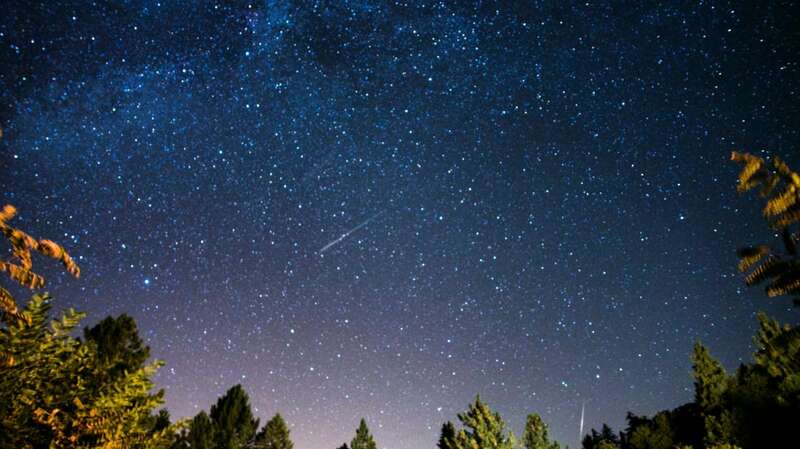 Scientists aren’t entirely sure how it formed, and other facts, like its shape (more egg-like than spherical), and the consistency of its surface (dusty but firm), were confirmed only recently. With the 50th anniversary of the Apollo 11 Moon landing this year, and NASA preparing to return to the lunar surface for the first time in decades, it’s time to brush up on these facts about the Moon—from colorful names for full moons to the first landing on the dark side of the Moon. 1. The Moon may have formed when a giant object in the solar system hit Earth. Scientists aren't in total agreement on how the Moon formed, but the most widely accepted theory is the giant impact hypothesis. According to this theory, an object the size of Mars called Theia collided with Earth 4.5 billion years ago when the solar system was still new and chaotic. The impact dislodged matter from Earth’s crust, and the debris attached to whatever was left of Theia through the force of gravity. This scenario would explain why the Moon is made up of lighter elements found in Earth’s outer layer, but it still leaves some questions unanswered. If the giant impact hypothesis is correct, about 60 percent of the Moon should consist of the impact object. Instead, its composition is almost identical to that of Earth. There are alternative explanations: one posits that the Moon is a space object that got caught in Earth’s orbit, and another one suggests the Moon and Earth formed at the same time, but none is as popular as the giant impact theory. 2. The Moon is the perfect size for solar eclipses. A lucky set of circumstances make total solar eclipses, as seen from Earth, possible. The Moon is just the right size and distance from our planet to appear as the same size as the Sun in the sky. When the Moon passes between the Sun and the Earth, it covers the Sun perfectly with an impressive corona illuminating its edges. If it were any smaller or farther from Earth, it would look like a blot on the Sun during a solar eclipse. 3. A full Moon has different nicknames in different seasons. A full moon can have many colorful names, but they don’t always describe a special celestial phenomenon. Some are used to refer to a full moon that appears during a certain time of year. A harvest moon, which is the full moon closest to the autumn equinox, is the best-known example, but there are many others, including a wolf moon (first full moon of January), strawberry moon (June), and sturgeon moon (August). 4. It’s the largest moon in the solar system relative to its planet. Our Moon isn’t the largest in the solar system (that distinction goes to Ganymede, one of Jupiter’s 79 moons), but it is the biggest in relation to the planet it orbits. With a diameter of 2159 miles and a surface area of 14.6 million square miles, the Moon is a little more than one-fourth the size of Earth. The dwarf planet Pluto has an even smaller moon-to-planet ratio. Pluto’s largest moon Charon is nearly the size of its host body, leading some astronomers to refer to the pair as a double-dwarf planet. 5. The Moon is shaped like a lemon. 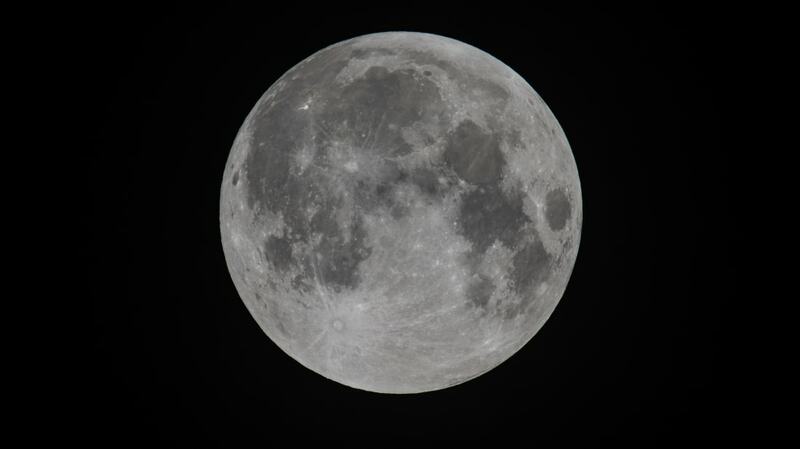 The Moon may look perfectly round in the night sky, but it’s actually more of an oval shape. It came out wonky billions of years ago when super-hot tidal forces shaped its crust, heating up some areas hotter than others to form a lemon shape rather than a perfect sphere. Gravitational forces from Earth have helped to exaggerate the Moon’s oblong appearance over eons. 6. Scientists thought Moon dust would cause lunar landers to sink. When preparing to send missions to the Moon, some scientists feared that a thick layer of dust on the body’s surface would cause complications. One of the strongest proponents of the dust theory was Thomas Gold, an astrophysicist at Cornell University. He insisted that the Moon was covered in seas of dust soft and thick enough to swallow a lunar lander. Though the Moon’s surface is dusty, the layer is too thin to cause problems, as the successful landings of the Soviet Luna 9 and the American Surveyor spacecrafts proved in 1966. 7. The Moon is international property. Astronauts Buzz Aldrin and Neil Armstrong may have planted an American flag on the Moon in 1969, but it belongs to the world. Countries like the Soviet Union and the U.S. made sure of that at the height of the space race in 1967 when they signed the Outer Space Treaty, a document declaring that the Moon would be a “global commons” and any resources discovered there would be used for the good of the world overall. In keeping with the spirit of the agreement, NASA shared soil samples taken from the Moon with Soviet scientists upon the Apollo 11 mission's return. 8. Humans have left strange things on the Moon. Since the first people landed on the Moon in 1969, its surface has been home to more than just dust. Earth artifacts left on the Moon by astronauts include two golf balls, an obscene Andy Warhol doodle, and a message from Queen Elizabeth II. Eugene Cernan, Apollo 17 commander and one of the last people to walk on the Moon, traced his daughter’s initials into the soil when he visited in 1972. Without any wind or weather on the Moon, the letters TDC could remain there forever. 9. The "dark side of the Moon" is the result of synchronous rotation. Even though the Moon is constantly rotating, only one side of it is visible from Earth. This is because the Moon is locked in synchronous rotation. It takes the Moon just as long to complete one full rotation as it does for the body to orbit around the Earth once, so the same side always faces our planet. This isn’t a coincidence—the Earth’s gravitational forces have gradually pulled the tip of the slightly oblong Moon to point toward the planet, creating something called tidal lock. In January 2019, the Chinese space agency landed the first lunar probe on the unexplored dark side of the Moon. The Chang'e 4 spacecraft sent the first photographs of a massive impact crater on the dark side to Earth, giving scientists their first glimpse of that unknown region. 10. One astronaut was allergic to the Moon. Apollo 17 astronaut Harrison “Jack” Schmitt discovered the hard way that some people are allergic to Moon matter. Following a survey of a valley in the Sea of Serenity, he climbed back into the crew’s lunar module and tracked in a lot of Moon dust with him. The dust affected him as soon as he removed his spacesuit, triggering red eyes, sneezing fits, and other symptoms that lasted two hours. 11. Humans are going back to the Moon soon. After completing several manned missions to the Moon, NASA ended the Apollo program in 1972 as budgets tightened and public interest waned. That means most people alive today have never witnessed a manned lunar landing, but now, following a hiatus nearing 50 years, NASA is finally preparing to return to the Moon. The next manned lunar expedition will be ready to launch “no later than the late 2020s,” according to the space agency. One of the goals will be placing a command module, called Gateway, in the Moon’s orbit that astronauts can reuse over multiple missions. It was hard to hear the dialogue above the screams, but riders sitting through early test runs of ExtraTERRORestrial Alien Encounter in Walt Disney World in Orlando, Florida, got the ride’s basic premise. A friendly group of aliens are showing off their new teleportation technology. Halfway through the demonstration, something goes wrong: They accidentally send a carnivorous monster to Earth, and when the lights flicker off, the alien creature starts attacking audience members. Though the attraction didn’t offer any steep plunges or high-speed turns, it aimed to be one of Disney’s premier thrill rides, with the most heart-pounding moments taking place as guests sat still in complete darkness. But when Disney chairman and CEO Michael Eisner experienced ExtraTERRORestrial Alien Encounter for himself in January 1995, he was unimpressed. By that point, Disney had already spent eight years developing the ride, which was meant to be the showpiece of Tomorrowland's $100 million makeover. It frightened early test-riders—the Orlando Sentinel reported people screaming over the dialogue and running for the exit—but Eisner felt the ride wasn't scary enough. Instead of clearing it to open later that month as planned, he ordered the park’s designers (also known as Imagineers) to shut it down and ramp up the intensity. Five months later, one of the most terrifying rides in theme park history opened in "The Happiest Place on Earth." Concept art for ExtraTERRORestrial Alien Encounter. Disney wasn’t a top destination for thrill-seekers when Michael Eisner took over the company in 1984. The parks’ classic rides, like It’s a Small World, Pirates of the Caribbean, and even The Haunted Mansion, were beloved for their nostalgia, not for their fear factor. Eisner’s teenage son Breck made this clear when he turned down the chance to go to Disneyland in California, saying the park was too lame. Determined to lure the teen demographic, Eisner began looking for ways to bring more thrills to Disneyland and Walt Disney World. Alien Encounter was conceived as part of this reimagining. A lot of the early ideas of what the ride would be ended up making it into the final product—guests would be seated in an arena-style theater facing an animatronic alien that would ultimately escape and terrorize them all in the dark. But instead of a generic alien, the villain was originally meant to be the Xenomorph from the Alien franchise. A gory, R-rated property may seem like an odd match for Disney World, but the partnership was years in the making. Disney had come close to building an Alien-themed ride in the 1980s called Nostromo, where riders would shoot down Xenomorphs with laser guns mounted to their cars. Nostromo never made it past the design stage, but Alien found another home at Disney World when The Great Movie Ride opened at MGM Studios in 1989. The ride recreated iconic scenes from film history, including Ripley’s showdown with a Xenomorph at the end of Alien. Following that attraction’s success, Disney looked for more opportunities to use its license of the Alien franchise. Disney launched an ambitious renovation project of Tomorrowland around that time. Walt Disney’s concept of the future hadn’t aged well since the parks first opened, and Imagineers were tasked with recreating the world of tomorrow for modern audiences. Tomorrowland 2055 would welcome parkgoers into an intergalactic alien spaceport—a.k.a. the perfect setting for the next attempt at an Alien ride. Eisner was 100 percent on board with Alien Encounter, and a full-fledged Alien ride may have opened at the Magic Kingdom in Disney World if it wasn’t for some detractors working behind the scenes. Many of the theme park’s more seasoned Imagineers opposed a ride that was not only based on an R-rated property, but contradicted Walt Disney’s optimistic vision of tomorrow. Unable to convince Eisner to nix the project on their own, the Imagineers enlisted the help of entertainment heavyweight George Lucas, who was working as a consultant on the Indiana Jones ride for Disneyland at the time. Lucas also felt that Alien Encounter was too intense for the family-friendly park, and he agreed to collaborate on a toned-down, Xenomorph-free version of the ride. With Lucas’s name attached, Eisner was willing to let go of the Alien brand, and an updated take on Alien Encounter, now called ExtraTERRORestrial Alien Encounter, went into development. Though their project no longer featured aliens that burst through chests or bled acid, the design team still had the chilling atmosphere of Alien on the brain. The movie’s influence was apparent when ExtraTERRORestrial opened in Tomorrowland on June 20, 1995. 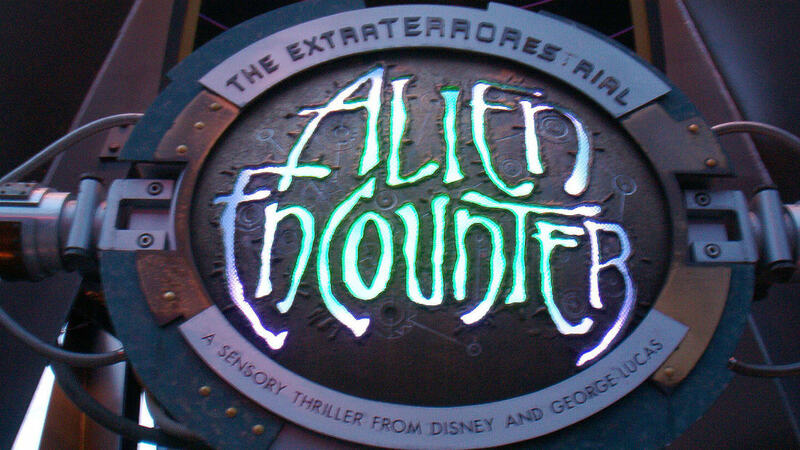 ExtraTERRORestrial: A Ride "Too Intense for Children and Some Adults"
After months of anticipation, ExtraTERRORestrial Alien Encounter finally earned Eisner’s approval, and Disney World guests were able to experience it for themselves. By adding new special effects and tightening up the story, Imagineers had retooled the ride into something guaranteed to engage and terrify even the toughest critics. Warnings posted outside indicated this wasn’t an average Disney ride: “The ExtraTERRORestrial Alien Encounter is a frightening theatrical experience in a confined setting with loud noises and moments of total darkness,” one sign read. It went on to say the ride “may be too intense for children and some adults.” But that didn’t stop parents from taking their young children into the attraction. Once inside the building, guests waiting in line watched a robot voiced by Tim Curry demonstrate a “teletransporter” made by the fictional alien technology company X-S Tech, using a furry, yellow alien named Skippy as his guinea pig. When transporting Skippy from one containment tube to the other, the machine glitches, and the cute alien materializes looking burnt-up and in pain. The disturbing pre-show was meant to introduce riders to the teleportation device’s intended purpose, as well as its flaws, and to give them a taste of the ride’s dark tone while they still had time to turn around and run. The main show began when riders were ushered into the theater-in-the-round and strapped into their seats with harnesses. A team of Alien X-S Tech representatives greeted Earthlings from their home planet via video monitors and announced that they were about to do an interstellar demonstration of their teleportation device. X-S Tech’s chairman volunteered to make the journey to Earth, but what appeared in the tube at the center of the room was clearly not the same alien audience members saw on the screen. Through strobe light flashes and billowing fog, riders caught a brief glimpse of the animatronic creature—a towering monster with leathery wings, a reptilian tongue, and glowing red eyes. The sound of shattering glass echoed throughout the theater and then the lights went dark: The creature had escaped. In an effort to impress Eisner, the Imagineers tasked with tweaking the ride added more tactile special effects. They borrowed elements from Honey I Shrunk the Audience!, a newly opened show at Epcot that used 4D effects, such as water spritzers to simulate being sneezed on. On ExtraTERRORestrial, these same effects were meant to horrify parkgoers, not gross them out. Through strategically placed speakers and 4D devices, riders heard repulsive slurping and crunching noises, then were sprayed in the face with warm water—making them think they had been splattered with fresh blood. At one point, harnesses pressed down onto riders’ shoulders to make it feel as if the monster was crouching on top of them. Warm air and water released from the seats replicated what it might feel like if the creature was slobbering down the back of each audience member's neck. Instead of watching the horror unfold on a screen, each guest was made to feel as though the alien was stalking them personally. Screams filled the room from start to finish, though it wasn't always possible to tell which cries for help were coming from audience members and which were part of the scripted show. Eventually the monster was captured and the lights came back on, revealing that no one in the theater had actually been harmed ... or consumed. Throughout the late 1990s and early 2000s, ExtraTERRORestrial was Disney World’s most divisive attraction. Young kids and parents coming to Disney to see Cinderella and Goofy may have felt betrayed by the ride’s intensity, but older kids and teens, the group Eisner originally wanted to win over, loved it. Despite the praise it received, ExtraTERRORestrial’s life at Disney World was cut short. In 2003, Disney closed the ride with plans to open a new, much tamer theme park experience in its place: Stitch's Great Escape! recycled much of ExtraTERRORestrial’s setting, special effects, and concept—but instead of surviving an encounter with a bloodthirsty alien, riders instead faced the cute protagonist of Disney’s hit property, Lilo & Stitch. Disney never explicitly stated why it shuttered ExtraTERRORestrial Alien Encounter, but it was clear they wanted Stitch’s Great Escape! to appeal to a wider audience. The Orlando Sentinel called the new ride, "a milder version of the Magic Kingdom's too-scary ExtraTERRORestrial Alien Encounter." Designing it for everyone didn't make Stitch's Great Escape! very popular. The 4D effects that had felt thrilling on ExtraTERRORestrial now seemed obnoxious; instead of splattering you with "blood," Stitch let out a chili-dog scented burp in your face. Attendance was so low that in the 2010s, the ride transitioned to seasonal operation. In 2018, the ride closed indefinitely, and while Disney denied reports that Stitch’s Great Escape! was gone for good, leaked images of a dismantled Stitch animatronic suggest the ride won’t be reopening. Though ExtraTERRORestrial Alien Encounter has been closed for more 15 years, the demise of Stitch's Great Escape! is a loss for fans of the original attraction. The updated show had recycled many parts of the 1990s ride, including animatronics like Skippy the alien (he was never tortured in the Stitch version). Now nostalgic Disney lovers have to scour memorabilia on eBay for evidence that the horrifying Magic Kingdom ride ever existed.